Have you ever wondered where all the BIG ‘gurus’ get their Top Quality website designs from? You know, the sites you see all the time, that are raking in thousands and thousands every single day. Well, you could not be further from the truth! 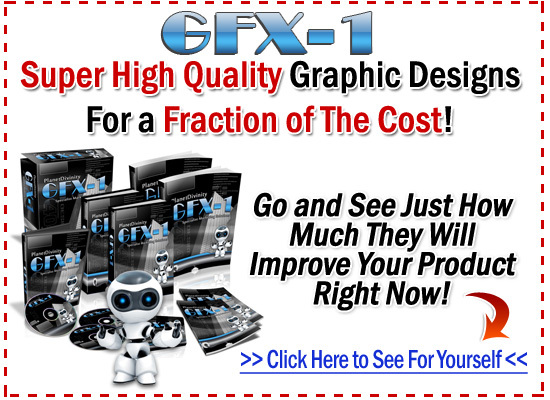 GFX-1 are quite simply the lowest cost, highest quality graphic designers on the net… Bar NONE! Once you have your own ‘professional’ graphics, you’ll start to see it reflect on your sales… BIG TIME! Remember that age old saying ‘a picture paints a thousand words’, well, believe me it REALLY does! Go and get your site upgraded or created right now and you’ll see exactly what I mean. First class graphics, and customer service is second to none! I’m great thanks Noel hope you are. As well as providing high quality graphics, Steve also provides first class customer service and value. I have experienced this great service many times before. I’ll never go any where else again for my graphics. I have also gotten graphics from GFX-1 before and I absolutely loved his work. Plus he was also very good in terms of communication and managed to get my graphics completed way before time. Looks like we have found a great resource between us! Thanks for stopping by Clarence.